G2-EXO Water Quality Monitor - NexSens Technology Inc. The NexSens G2-EXO provides live data access to a YSI EXO multi-parameter sonde. Included solar power pack and integral cellular system provide real-time data and notifications. Connect a YSI EXO sonde to the G2-EXO's impulse connector and let the system autodetect the pre-configured parameter output and begin recording. No need to manually configure the logger to record the correct data. Note that EXO1 and EXO2 sondes that do not support direct SDI-12 require the -DCP version of the G2-EXO. An embedded cellular modem provides live, customizable water quality notifications on a mobile device or computer. 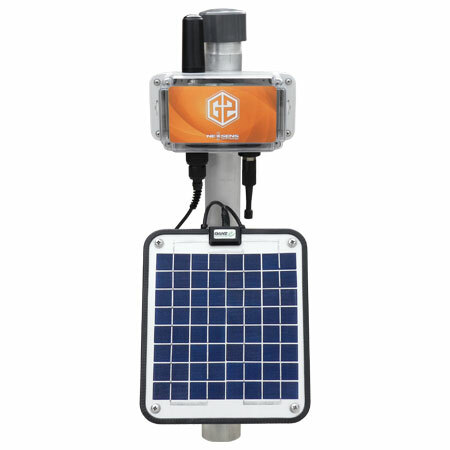 The G2-EXO incorporates logger, transmitter, solar power, and online data management into a streamlined design. All equipment comes pre-mounted to a 2" NPT MAST. This simplifies setup and maintenance and allows the system to be used in a wide range of applications and environments. Simply connect the EXO sonde and the G2-EXO begins recording and transmitting data. View live and historic data in a simple and intuitive interface from any web-enabled device. WQData LIVE is optimized for mobile devices to provide a great experience regardless of screen size. No need for a site visit to make configuration changes. Queue the commands online and the remote G2-EXO will be configured on the next transmission connection.